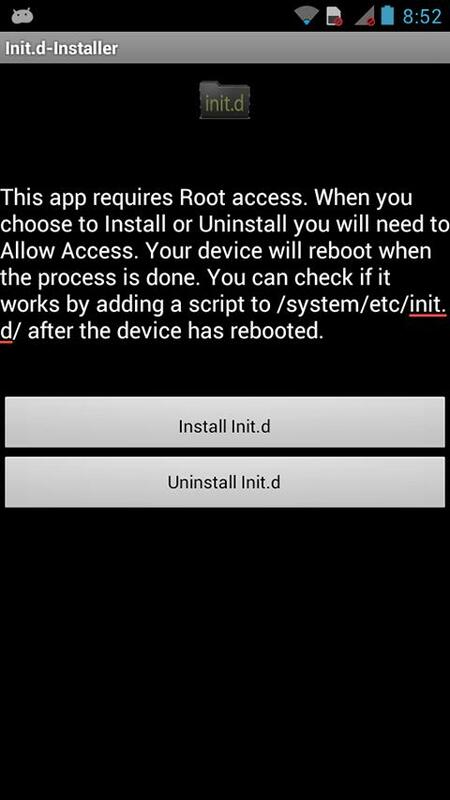 Init.d Installer is a root application for most Android devices. It installs the proper files to make init.d scripts in the /system/etc/init. It installs the proper files to make init.d scripts in the /system/etc/init.d/ folder run on boot for the device it is installed on. It also has an option to uninstall these files in case the user does not want them anymore. How can I tell it worked? Use a Root Explorer-type application and check your ~/system/etc/ for the /init.d/ folder. If it's there, it worked! You can push .sh scripts to that directory and your phone or tablet will run that script on boot from then on, assuming you set the permissions on that script as executable. What devices will it not work on? It would be very hard to list every single device and near impossible to test them all. However, this will 100% not work on Intel-based smartphones such as the Motorola RAZR i and the Orange San Diego. This functionality may be added in the future. This app is Open Source! You can compile it yourself from the github below.